The new G 350 d is the perfect blend of iconic G-Class styling and rugged go-anywhere ability. The G 350 d is powered by a 3.0-litre six-cylinder diesel engine, with an output of 286 hp and 600 Nm of torque. 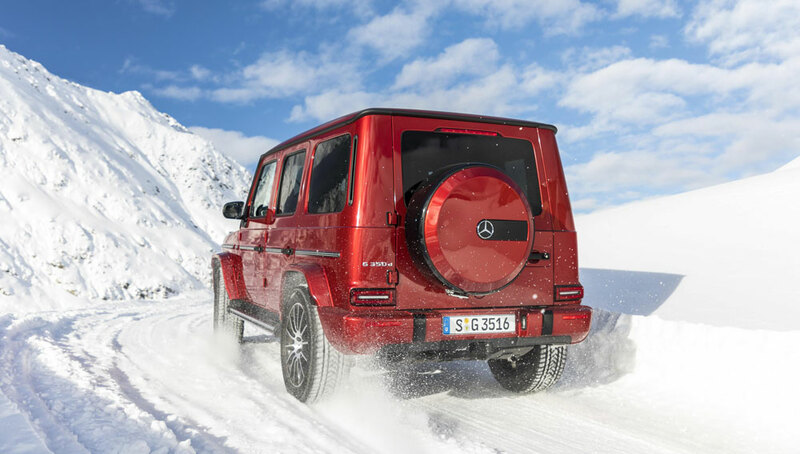 It’s the most powerful diesel engine ever to have been fitted to a G-Class. It can travel from 0 to 62 mph in 7.4 seconds and has a top speed of 124 mph. It delivers up to 29.4 mpg on the combined cycle and emits 252 g/km of CO2 (depending on wheel size). The G 350 d comes as standard with 20-inch AMG multi-spoke light alloy wheels; LED high performance headlights; mirror package including electrically adjustable and heated wing mirrors; leather seats; 12.3-inch cockpit display and 12.3-inch media display; ambient lighting with a choice of eight colours; AMG body styling; electrically adjustable heated front seats with memory function; heated rear seats; assistance package including blind spot assist and active distance assist DISTRONIC; Keyless-Go starting function; active lane keeping assist; Thermotronic automatic climate control with three climate zones; and radiator grille with chrome trim elements. There are a number of option packages available. The Premium package costs £5,995 and comes with Multibeam intelligent light system; Adaptive air suspension; Burmester sound system; interior air ionisation; ambient lighting with a choice of 64 colours; sliding sunroof; and parking package with 360 o camera. The Night package can be added for £1,700 and includes 20-inch AMG multi-spoke light alloy wheels painted in black with a high-sheen finish; darkened indicators and tail lights; black radiator grille; black exterior mirror; heat-insulating dark-tinted glass and black spare wheel ring. The Winter package costs £1,750 and brings a heated windscreen and auxiliary heater with remote. A heated steering wheel is available in conjunction with the Winter package for £275. The Rear Seat Entertainment package is available for £2,995 and comprises two 10-inch touchscreen displays; a digital TV tuner; integral media player; and internet access. The new Mercedes-Benz G 350 d is now available to order, with prices starting at £94,000 OTR. Hayley has been an automotive writer for six years, and is the editor of a popular UK motoring blog. She specialises in Mercedes-Benz and dreams of one day owning a Mercedes AMG A45.